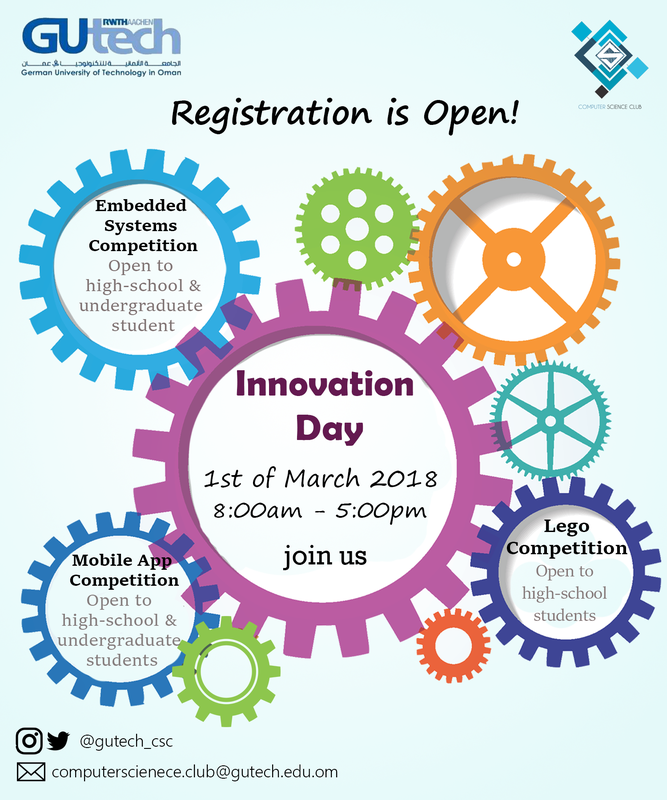 The Department of Computer Science and the Students’ Computer Science Club (CSC) invite teams from schools to participate in the Innovation Day 2017, at the German University of Technology in Oman (GUtech), on March 1st, 2018. This event is initiated and led by the members of the Computer Science Club – GUtech students’ group comprised of individuals who share common interest in both software and hardware aspects of computer science. The Innovation Day 2017 aims to aspiring students from schools and universities to STEM field and to sparking their interest in finding innovative solutions to human needs and problems through the development of systems and prototypes and the deployment of emerging technologies. The Innovation Day 2017 by CSC will be comprised of three competitions. The Lego Competition consists of Sumo Wrestling Robots and an Open Lego-based Applications Competition. 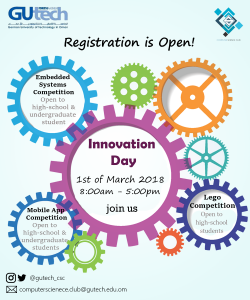 The Lego Competition is organised in collaboration with the Ministry of Education and it is open for students from public and private schools. This is open for teams of 4 students from grades 5 – 11. Teams should build their robots to fit the sizing box of 20 by 20 centimetres and should weigh under 3 kilograms. For an overview of the rules and the conditions for the Sumo Wrestling Robots competition, you may refer to Sumo Wrestling Robots – Requirements and Conditions to Participate as provided by the Ministry of Education. Please note that the document is in Arabic Language. This is intended for grades 5 – 11 from all schools who are keen on addressing a given local or regional problem through the deployment. Participating students should form teams of 4 members and a supervisor. The teams qualify to participate with self-designed and programmed robots. Ready-made robots are not allowed to take part in the competition. For an overview of the rules and the conditions for the Open Lego-based Applications competition, you may refer to Open Lego-based Applications – Conditions and Requirements by MoE as provided by the Ministry of Education. Please note that the document is in Arabic Language.